As community engagement manager, Tolbert oversees the Fossey Fund’s community projects in both Rwanda and the Democratic Republic of Congo (DRC). She develops and manages projects that link education and livelihood initiatives to improved gorilla conservation in Rwanda, and works to increase the capacity of local communities to manage community-run conservation areas in DRC. Tolbert specializes in understanding the relationships between people, resource use, and conservation, how national, local policies, and traditional environmental knowledge influences these relationships, as well as the scientific evaluation of community conservation programs. Tolbert has worked extensively in Africa as a natural resource manager with the Peace Corps and most recently served as the community forestry coordinator with Strong Roots, a Congolese conservation nonprofit that partners with communities living near gorilla habitat. 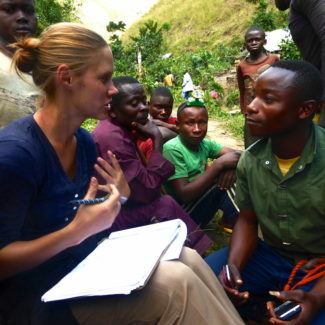 She obtained a dual master’s degree in Environmental Management and Global Affairs from the Yale School of Forestry and Environmental Studies and the Jackson Institution for Global Affairs, where she researched how community forestry could be used as a conservation model in the Eastern DRC. She also worked with the International Gorilla Conservation Programme, developing a monitoring tool to better understand the perceived costs and benefits that local communities report from mountain gorilla protected areas.